Kuala Lumpur (KUL) to Singapore (SIN) is the busiest route in the world. Lagos, Nigeria (LOS) and Delhi, India (DEL) are the top forwarding destinations from London Heathrow (LHR) for those travelling from New York (JFK). Dublin (DUB) to London Heathrow (LHR) is the busiest route in Europe, and ranks 14th in the world. The trip from Amsterdam (AMS) to London Heathrow (LHR) ranks as the 19th busiest route. Hong Kong (HKG) is the busiest Asian airport hub, listed in six of the top 20 busiest international routes. Three U.S. airports are cited on the top 20 busiest routes: LaGuardia (LGA) and O’Hare (ORD) with service to Toronto (YYZ), and John F. Kennedy (JFK) to London Heathrow (LHR). LUTON, England -- May 3, 2018 -- OAG, the global leader in flight information, has released its latest report, OAG Busiest Routes, which ranks the world’s busiest international routes for operating flight volume. The data highlights key characteristics for each route, including size, growth rates, market share, the type of aircraft and on-time performance (OTP) of carriers that service each route, and how passengers use each route for subsequent connections. The results are pulled from aviation data between March 1, 2017 and February 28, 2018. The busiest route in the world is from Kuala Lumpur (KUL) to Singapore (SIN), which serviced 30,537 flights over the twelve-month period. The trip from Hong Kong (HKG) to Taipei (TPE) followed closely behind, finishing second overall. In Europe, the routes from Dublin (DUB) and Amsterdam (AMS) to London Heathrow (LHR) were the busiest, ranking 14th and 19th, respectively. Aer Lingus is the most punctual airline on the route from Dublin (DUB) to London Heathrow (LHR), with 84.7 percent OTP. London is the final destination for 50 percent of passengers on this route, while the other half travel onward to other cities, most commonly Los Angeles (LAX), San Francisco (SFO), New York (JFK), Lagos, Nigeria (LOS) and Hong Kong (HKG). For passengers travelling west from London to Dublin, the top five connecting destinations are all located in the United States: Chicago (ORD), Boston (BOS), New York (JFK), Washington (IAD) and Newark (EWR). On the route from Amsterdam (AMS) to London (LHR), which is serviced by KLM-Royal Dutch Airlines (77 percent OTP) and British Airways (72 percent OTP), 61 percent of travellers originating in Amsterdam stay in London, while the other 39 percent connect elsewhere. 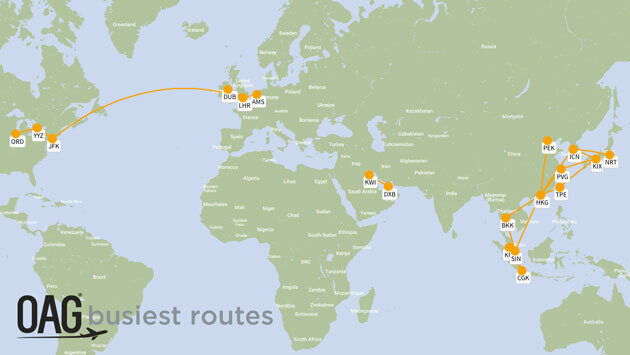 The route’s top five connecting destinations include New York (JFK), Los Angeles (LAX), Johannesburg (JNB), Miami (MIA) and San Francisco (SFO). The trip between John F. Kennedy airport and London Heathrow is the 16th busiest international route, and the second most popular route out of the United States, with 13,888 flights serviced over the 12-month period. American Airlines is the most punctual airline on this route, with 77.9 percent OTP, whereas British Airways has the largest market share. Asia remains home to most of the busiest international routes, with 14 of the top 20 routes operating to and from destinations in this region. Five of the top 20 routes depart from Hong Kong, with service to Taipei (TPE), Shanghai (PVG), Seoul Incheon (ICN), Singapore (SIN) and Beijing (PEK). To qualify for the on-time performance measurement in this analysis, the OAG schedules data base must have flight status data for at least 80 percent of all recorded flights for an airline or airport. On-time performance (OTP) is defined as flights that arrive or depart in under 15 minutes of their scheduled arrival/departure times. Cancelations are also included. For more insights on the world’s busiest international routes, download a copy of the full report.